We start, and pretty much end, on battery care, with some other stuff to check thrown in at the end. Batteries are the life blood of any electric vehicle and the better you treat & care for them the better they will serve you. Treating them well means keeping the racks, tops & terminals clean, ensuring that all cable connections are adequately tight, adding distilled water at the proper times in the proper amount, and keeping them fully charged without overcharge. That is the way they last the longest… plain & simple. We realize that not everyone is in a location where the weather is turning colder. Many readers are tuning up their golf cars, both gas & electric, for use during our so-called winter months. We invite you to read our, now out-of-season, Put Spring In Your Golf Car presentation. Completely rewritten in Spring of 2004, it outlines how to put the sizzle back your golf car. Thanks for visiting. First, make sure all the cell caps are snuggly seated. Unplug the charger and move the car to a nearby place where there is a hose and the neutralized acid water, grass, and mud you are about to wash off will safely wash away. Be sure you are not wearing your best pair of jeans or any other cotton clothing. Hydrosulphuric acid loves cotton. It’s fond of tender skin too, so you may want to wear a pair of gloves and even a face protector. Lock the hill brake. If the seat bottom is removable go ahead and take it off. Most modern seats will conveniently lift straight up and off the car when they are in the upright position. The hinge is a simple ‘L’ bracket. Be careful of your back though, they sometimes can be heavy to lift from one side. If you have a ‘Regen’ electric drive system (see note at end of this paragraph), set the master switch under the seat to the ‘Tow’ or ‘Tow/Maintenance’ position. This turns the car completely off. If you do not have a ‘Regen’ electric drive system, just put the Forward/Reverse switch into the “Neutral” position (straight up) and remove the keys. This also turns the car off so no battery current can run to the motor. NOTE: ‘Regen’ electric cars have an electronic braking system built into the speed controller of the car. The special ‘sep-ex’ motor & computerized speed controller work together as a pair to limit the downhill speed of the car, sometimes quite severely. In addition to limiting the top speed of the car, ‘regen’ cars have another feature called ‘roll-away protection’. If the car starts to roll after coming to a complete stop, the controller will not allow the car to roll faster than 2 or 3 mph, even down a steep hill. A warning buzzer starts beeping to alert you & the slow speed allows time to walk after the car & set the brake. As long as the TOW/MAINTENANCE switch is in the ‘RUN’ mode this ‘roll-away protection’ function is active and the system is ‘looking’ for a roll-away situation. It cannot tell that the car is sitting level in a field and could never roll…it’s just ‘on’. Even though the key is off & the F&R switch is in Neutral the roll away monitor is still ‘ON’. The bad news is the ‘roll-away protection’ system uses battery juice to monitor the movement of the car. Within 3 to 4 weeks the batteries can become too discharged to power the car, and even too dead for the charger to cut back on to recharge the batteries (making it appear as if the charger has gone bad too). This creates all kinds of headaches, as those that have encountered this well know. The solution is simple. Turn the ‘RUN/TOW’ switch to the ‘TOW’ position when leaving for more than a few days and ALWAYS charge the batteries before you leave. NEVER leave the batteries discharged for more than a day or two–at most! We recommend that you DO NOT disconnect any battery cables, for this maintenance procedure or for winter storage, unless it is necessary to clean them. There is some other maintenance to do to the cables, but we will cover that later as well as battery disconnect procedures. Start on one side of the car and spray Battery Acid Neutralizer all over the tops of the batteries. Be sure to spray it between the batteries, down on the battery racks, and the inside walls of the body panels, if they are metal. Now use an old paintbrush to scour all the nooks and crannies of the battery tops and sides. Use a little extra water if you need. Follow the directions on the bottle in applying and rinsing the Neutralizer. This liquid will change color to signify that it has neutralized the acid. Allow this to sit and work for a few moments. Wash thoroughly with copious amounts of water, standing a few feet back to avoid any acid splash. Wearing a pair of goggles may be a good idea. Water from a garden hose, or even a commercial high pressure washer, will not hurt the electrical components of the car long as you don’t beat the high pressure on any of them for a long period of time. Many golf clubs wash the battery compartment out every day…not a bad idea! If you do not want to buy the Battery Acid Neutralizer, it is OK to use a solution of two tablespoons baking soda for each gallon of water. However, you will be introducing some environmentally un-friendly chemicals to the ground water. In fact, in some jurisdictions, this is considered dumping hazardous waste. Improperly washed batteries will not only stain concrete but actually erode the finished surface over time. For this reason, we don’t recommend that you use this method. For your personal safety always, always, always remove all metal watchbands, necklaces or bracelets before working with batteries. If the jewelry becomes a short circuit between batteries, it will ruin your day, not to mention the jewelry! Eye safety is a vital concern too, so be sure to wear eye protection! A spark from a cigarette or an inadvertent battery short, such as a dropped tool or ring, can cause a battery to explode, spew battery acid, and possibly catch fire. (We know this from personal experience.) Extreme caution is required. Should you ever drop a wrench or other tool onto a battery top, back away immediately! It’s a whole lot cheaper to replace a battery than have a bill from the emergency room. Retrieve the tool after the smoke clears. This is an excellent time to check, clean, tighten, and treat all of the battery terminal connections. Battery cable looseness, oxidation, and corrosion all interfere with the flow of electricity, create excess heat, and decrease the efficiency of your electric golf car. Firmly wriggle each cable end side-to-side and then gently flex the metal cable end up and down. There should be no looseness or movement sideways. If there is then the nut that secures the cable end to the battery post probably needs to be tightened some more. Use the adjustable wrench to tighten the nut, clockwise, just a little. If the cable will not tighten, even if the nut feels tight, there may be a problem with the battery post. Chronic looseness of the cable end will cause a heat buildup, which causes the nut to ‘freeze’ to the battery stud. If the connection is loose enough the heat will cause the lead post to actually melt away from the cable end. You can see the melted lead on the side of the post, much like a melted candle…sometimes even a pool on the battery top. If it’s real bad, little beads of lead fall on the battery top and melt through the case allowing acid to jostle out as the car moves along. Be sure the cables are tight to the post. Don’t over-tighten them or break them off, but they should be good and snug. The up and down flexing motion of the cable end, which is secured to the battery post stud by a nut, should not cause the metal terminal end to flex; it also should be rigid to the post. The cable may flex but the metal terminal end should not. If it does easily flex, or worse, it’s downright floppy, you have a battery cable end about to give it up. Fix it before it fixes you, where you least expect it! Most modern cars use a threaded stud at the top of the battery post to secure the cables to the battery. There are still a few oldies but goodies out there that use a wrap around lead ‘banjo’ terminal to connect the cables to the post. This old-style banjo terminal is still common on many gas golf cars. Over time the lead surface inside the terminal end, and the outer surface of the battery post, can become quite resistant to the flow of high electric current. Although the post and terminal end may ‘look’ OK, they in fact may have built up a tough, crusty oxidation. A wire brush or a wire battery terminal cleaner may not be enough to remove this insulative buildup. Both the outer battery post and the inside of the lead terminal should scraped until a bright shiny clean. You can do this with a sharp knife, but a better bet is a Terminal Cleaner designed specifically for the job. The type of oxidation mentioned in the above section seems fundamentally different from corrosion. Although both are caused by the acid atmosphere in and around the batteries, corrosion is much more sinister. The crust and/or cable looseness can cause the car to stop. Corrosion just eats the car alive. Aluminum and steel frames alike! Aluminum frames handle salt air better than steel but both are the vegetable de jour to battery acid. Oxidation is almost invisible but corrosion varies from white billowy, cloud-like crystals on aluminum & fluffy powder on steel battery racks to yellowish-blue goo on the battery terminals…yuk!! The positive battery terminals generally take the brunt of the corrosion, but the negative posts will corrode as well. If they are badly corroded, you will need to do some serious cleaning. You may need to remove the corroded cable end(s) from the battery, soak them in a neutralizer, wire brush the metal ends and then carefully inspect them. If the ends are ok (no visible signs of deterioration of the metal), firmly wire brush the battery post clean, reinstall the cable on the battery and tighten the nuts securely to the battery post. Make sure the nuts are clean too. Don’t re-contaminate a clean cable end & post with a corroded nut. IMPORTANT NOTE: Some of the modern ‘regen’ cars require a certain sequence of disconnecting the battery cables. 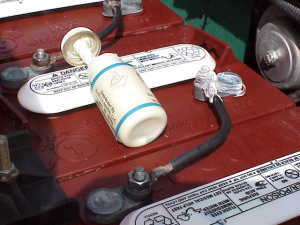 Commonly, switch the ‘TOW’ or ‘TOW/MAINTENANCE’ switch away from the ‘RUN’ position, then disconnect the main negative battery terminal before disconnecting any others. Reconnect all other cables before reconnecting the main negative. Then flip the ‘TOW’ switch back to ‘RUN’. We strongly recommend you have the appropriate Service Manual at hand when performing these procedures or troubleshooting these modern systems. Corrosion can appear as thick yellow goop, white powdery fluff, or as a bluish goo. Sometimes these different kinds are on the same terminal or post or battery rack. This is never a good thing, as corrosion seems to beget more corrosion. Real trouble comes when it starts to get on the frame of the car. Wave goodbye to the battery racks and car frame in severe cases. Corrosion is very easy to prevent; once cleaned properly, just hose off those batteries and racks several times a year. Better yet start when they are brand new! Check the water levels in each cell. Take the hassle out of this task by using a Battery Filler Bottle. Use distilled water, because lead acid batteries can be damaged by certain elements found in tap water, especially chemicals used in home water softener systems. Be sure the electrolyte (water) in each battery cell is above the plates. In cold climates, when the car will be left uncharged for several months, leave the water level a little low (be absolutely sure the electrolyte level stays above the plates). This raises the specific gravity of the acid a little, which will help prevent freezing. It is a little known fact that a lead acid battery keeps much better in the cold than in the heat, as long as the charge stays up. A fully charged battery (specific gravity: 1.275 to 1.280) will not freeze until 60º to 70º below zero, whereas a discharged battery can freeze at 20º degrees above zero. As a battery discharges, the acid (liquid electrolyte) turns into water. This is due to the basic chemical nature of the way a lead acid battery works. The more discharged the battery, the more water is present and the more likely the water is to freeze. Keep in mind that a dirty, acid covered, untreated battery will self discharge at a much faster rate than a clean treated battery, even in cooler temperatures. The heat of a Florida summer can cause a battery to self-discharge in 30 days. Of course, freezing is not a great risk but a discharged battery will sulfate, which basically means crystals of lead sulfate clog the tiny sponge-like cavities of the battery plates. The longer the state of discharge lasts the more this hard-to-dissolve crystalline structure builds up. It is a harmful, and costly, condition if left unattended. Adequate charging avoids this situation. A little preventative maintenance can save you a lot of money down the road. Anti-Corrosion Gel protects your batteries from oxidation, increasing their life. Okay, we have washed and cleaned and inspected and tightened and neutralized. Let the car drip dry for a while and then coat the battery terminals with Anti-Corrosion Gel to inhibit future corrosion. When used on a new or clean terminal, proper protection can last for years with little care. If the terminals are corroded, treatment does little but add to the mess. Don’t believe the claims that a little spray here and there takes care of badly corroded batteries. Clean them thoroughly. Now, let the car fully charge. We recommend that you do not leave your charger plugged into the golf car or the AC wall current for extended periods of time during your absence. Lightning can travel down the external power lines, into your garage, through the charger, and into the electronic speed controller & the motor of your car. It can blow out the charger transformer and destroy the speed controller too. You’re talking big bucks to get all that replaced. Older cars and chargers build before the mid 80’s are not nearly as sensitive to voltage surges but nearby lightning can take these charger transformers out too. After the batteries are fully charged, unplug the charger from the car and from the wall. If you have a Regen model electric car, be sure to turn the switch under the seat to “Tow” or “Tow/Maintenance”. This fully shuts the car down. This is a very important step when winterizing the car. If left in the “Run” mode, the electronic speed controller stays energized and continues to monitor for a roll away situation, even though it is on the level floor of your garage. This monitoring is powered by the batteries, which soon become discharged and susceptible to sulfation and freezing & bursting. If you do not have the Regen system, then just leave the car in “Neutral” and turn the key off. Block the wheels so you can leave the hill brake released. This prevents undue strain on the cables and the brake shoes won’t ‘freeze’ to the inner surface of the brake drum. Again, do not disconnect any battery cables as this may create more problems than it prevents: first, you cannot put the car on charge until you reconnect the batteries, second, if the cable is not properly reconnected and tightened, a terminal meltdown can occur, possibly destroying the battery, causing a fire or other dreaded consequence. Be sure to disconnect any electrical accessories you, or someone else, may have added to the car that might draw off the battery pack. These might include radio/cassette/CD players with memory buttons that allow one-touch station selection. Many of these units also come with a clock function. Some battery charge indicators are wired such that they are always ‘ON’…they don’t take much but they will run your batteries down. Many DC to DC voltage reducers are designed such that they are always ‘ON’. Double check, especially if you have just purchased the car. If you are not going away for the Winter, you can charge the batteries for a few hours a month to insure a full charge is maintained. If possible, have a neighbor or friend drop by during your absence and charge the batteries for a few hours once a month. The charger should be unplugged from the car and the wall after charging. Keep a close eye on the water level in the batteries as increased charging time will consume more water. Check the tire pressures and inflate to 20–25 PSI. If you have had any problems with a slow leaking tire, take some blocks of wood and put under the axle of that tire so that if it does go completely flat, the wheel rim will not sit on the deflated tire causing the sidewall to crack. While you are down there filling the tires, look at the tread and sidewalls. The tire tread wear should be even across the entire width of the tire. If the center is worn too much the tire may be over inflated. If the outer edges are worn away then a chronic air leak is indicated, maybe due to weather-cracked sidewalls or a pesky tee. If one front tire is worn a lot more than the other, or the tread has signs of feathering or scrubbing to one side or other, then an axle may be bent or a front-end alignment may be needed. Roll down the rain curtains and zip them part way down. If you must leave the car out in the open, or under an open shed, we strongly advise neatly folding the rain curtain (inside out on the top of the car) and bringing it in the house till Spring. Very cold weather will cause the see-through vinyl to become brittle and a puff of wind will blow it out. Rain curtains do not make good outdoor storage covers, especially in winter. Give your car a hug & say goodbye until next season!